Formed on Canvey Island in Essex in the early 1970's Dr. Feelgood have become one of the most popular live rhythm and blues acts in the world. 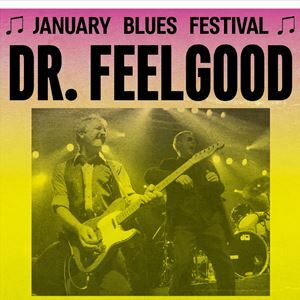 Dr. Feelgood have enjoyed a string of hit singles in many countries including "Milk & Alcohol", "Down at the Doctors", "Roxette", "She's a wind up" and "See you later Alligator". Jim Riley's Blues Foundation released their debut album "A Very British Blues Explosion" in 2018 to rave reviews. Producer and main man of Medway R&B group Wipeout, Jim Riley is backed by The Claim who help him recreate the authentic sound of British R&B. The debut album featured a mixture of originals and hand-picked covers by the likes of Sonny Boy Williamson, Jimmy Reed, Bobby "Blue" Bland, John Mayall and more.